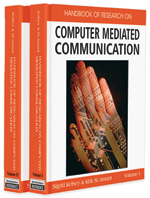 In this chapter, we discuss how culture influences computer mediated communication (CMC). We use an Input-Process-Output (I-P-O) model as a theoretical framework to analyze relationships between culture and CMC. We describe three dimensions of cultural variability—individualism/collectivism, low vs. high context of communication, and task- vs. relationship-orientation—and describe how these dimensions influence people’s reliance on features of CMC. A review of the literature to date suggests that cultural factors do indeed shape how people use CMC. More specifically, auditory and visual cues appear to have more importance for members of collectivistic, high-context, relationship-oriented cultures than they do for members of individualistic, low-context, task-oriented cultures. However, further research is needed to clarify relationships between cultural dimensions and CMC, to understand the role of moderating variables such as gender of participants, task, and group composition, and to provide design guidelines for new tools to support intercultural communication and CMC in developing regions. Relational Communication: Verbal and nonverbal aspects of how messages are conveyed that provide information about the relationship between speaker and addressee(s). Conversational Grounding: The activities by which speakers and listeners work together to ensure that messages are understood as intended. Media Affordances: The properties of CMC tools that permit people to use different communication strategies such as speech vs. typing. Individualism-Collectivism: The extent to which members of a culture identify themselves as individuals and focus on their personal gain vs. identify themselves as members of a collective and focus on group gains. Low- vs. High-Context of Communication: The extent to which communication in a culture is verbally explicit vs. ambiguous and sensitive to the context in which it occurs. Task vs. Relationship Focus: The extent to which members of a culture orient themselves toward getting work done vs. building good relationships with their colleagues. Input-Process-Output Models: Models of teamwork that examine relationships between variables people bring with them to an interaction (inputs), the interaction among people (process, and the subjective and objective outcomes of this interaction (output).